Ardglass player Cormac Sharvin missed out on a European Tour card by one shot as he finished in a share of 28th place at Final Qualifying in Spain. Sharvin’s closing two-under-par 69 in Tarragona left him sharing 28th place on 15 under in the six-round marathon. But that was one shot outside the top 25 and ties who secured cards. Sharvin fired four birdies and two bogeys in his closing round. A two at the par-three 17th left him needing a birdie at the last but he could only manage a par five. Ireland’s Gavin Moynihan achieved the target on the exact mark after a closing level-par 71 at Lumine Golf Club. Dubliner Moynihan endured a nervous finish as he bogeyed the 15th and 17th but his 16-under-par total proved enough to earn his playing privileges for next season. Spain’s Alejandro Canizares won the tour school with a closing seven-under-par 64 left him on 24 under. South Africa’s Zander Lombard also finished on 24 under but the Spaniard took the first spot after firing the lower final round. 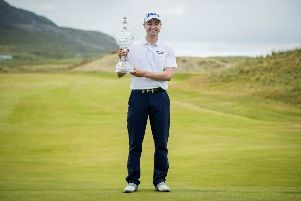 Former Northern Ireland Open champion Clement Sordet and Scotland’s Mark Warren were among those who finished in the top 25 and ties. Those to miss out on the closing day included European Tour winners Marcel Siem, Anders Hansen and Gregory Bourdy plus former US Open runner-up Gregory Havret. England’s Callum Shinkwin and Oliver Wilson were among the notables to miss Tuesday’s fourth-round cut with those failing to make the final 36 holes also including former PGA champion Matteo Manassero.